Dr. Cangemi and his family have been extremely generous supporters of our foundation and programs over the years. His devotion to our cause continues on. 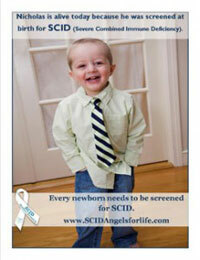 Please click on the Donate button below to make a donation to SCID, Angels for Life Foundation in memory of Dr. Frank Cangemi. The family has asked to receive acknowledgment of all donations made. Please check the box to include your mailing address so it can be shared with the family only. To view Dr. Cangemi’s obituary, please click on the link below.